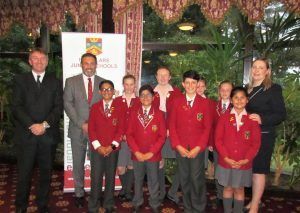 The annual Prize Giving for Highclare Junior Schools took place at Sutton Coldfield Town Hall, with many guests, parents and friends. Pupils from throughout the Highclare Junior Schools, J3 to J6 performed some of their best musical and drama pieces for guest of honour, Mr Neil Roskilly, Chief Executive Officer of the Independent Schools Association. 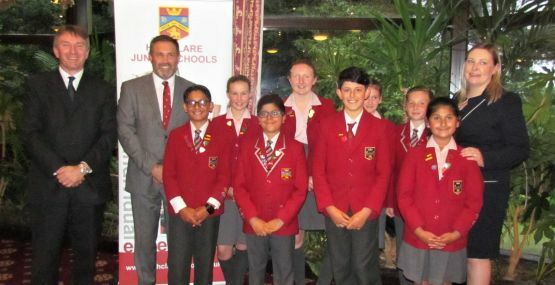 He commended the school and particularly the pupils for their dedication and excellent successes, handing Form Prizes and Progress Prizes to each year group. Dr Luker and Mrs Bennett addressed parents and guests on the topic of encouraging pupils to find their spark and the benefits of independent learning, highlighting the Take Charge initiative. Ms Broder, Head of Junior Music, conducted the finale of the evening with the whole Junior School joining together to sing‘When I grow up’ (from the Musical – Matilda). It was an amazing event where the pupil’s behaviour was exemplary, celebrating their success and amazing talents. A great way to end a truly successful year for Highclare Junior Schools. Highclare Juniors Schools comprises Highclare St Paul’s, at Lichfield Road, Sutton Coldfield, and Highclare Woodfield at Birmingham Road, Wylde Green, Sutton Coldfield. Pupils from 2 years to 11 years are catered for with many children moving forward at age 11 years to Highclare Senior School in Sutton Road, Erdington. Highclare School is an Independent Day School for boys and girls aged 2 years to 18 years. It is based on 3 separate sites within Sutton Coldfield and Erdington in the West Midlands.